May. 16, 2017 11:30 a.m.
After a decade at sea and two attempts at a single-handed west-about circumnavigation of the globe, Glenn Wakefield sailed home down the Strait of Juan de Fuca May 7. 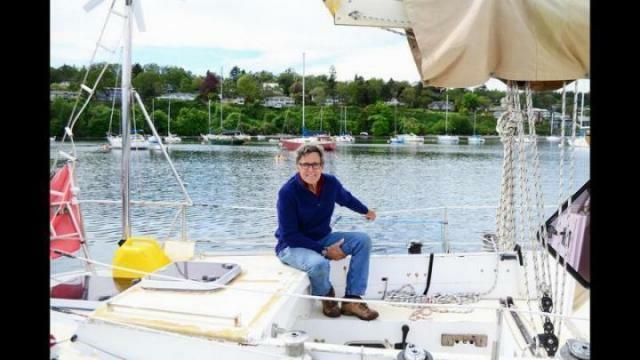 He docked in the Royal Victoria Yacht Club at 3:30 a.m.
Wakefield had always dreamed of sailing around the world and tried his hand at a long distance trip in 1997. “I had the best voyage [in 1997], and I was absolutely heartbrokenly lonely and missed my girls,” he said. He met his daughters and wife, MaryLou, in New Zealand, where they went on to travel together. In 2007, Wakefield set out on the Kim Chow to attempt his first solo circumnavigation. This marked the beginning of a 10-year sail. It took Wakefield seven months of nonstop sailing to get to Cape Horn from Victoria. During that time, his blog Kim Chow Around the World, managed by his wife MaryLou, took off with hundreds of subscribers. A Grade 5 class from Saskatchewan was so interested in Wakefield’s journey that they followed his updates for months. Wakefield says it was often hard to be alone at sea, but there was a comforting knowledge in his family and blog subscribers keeping track of his every move. His first voyage was stopped short due to a series of storms off Cape Horn. The Argentine Navy rescued him while Kim Chow could not be recovered. “I was capsized a couple times and had broken ribs and concussion and dislocated shoulder,” he said. He waited three days and 36 hours for the Argentine navy’s destroyer ship to arrive. Shortly after, he was flown home, but determined to set out again to complete the circumnavigation. A new blog, Going Solo, was launched to continue the voyage, and in 2013 Wakefield departed on West Wind II. He made it fives months into the voyage before discovering a critical rigging problem which forced him to dock in Perth, Australia. Once again, Wakefield flew home. He returned in to Perth in 2014 for the final stretch of the voyage. Due to bad sailing conditions this January, Wakefield left West Wind II for several months in Hawaii while he worked on a yacht in Florida. By the time April arrived, he was prepared to finish the last leg of what had become a ten-year voyage. “It made me realize how far I had been but never come home down the Straits of Juan de Fuca,” he said. He had a smooth sail back from Hawaii and braced for a long attempt at the Strait of Juan de Fuca. He arrived two days earlier than expected.